Every once in a while I run across a product that makes me shake my head and ask... Why? 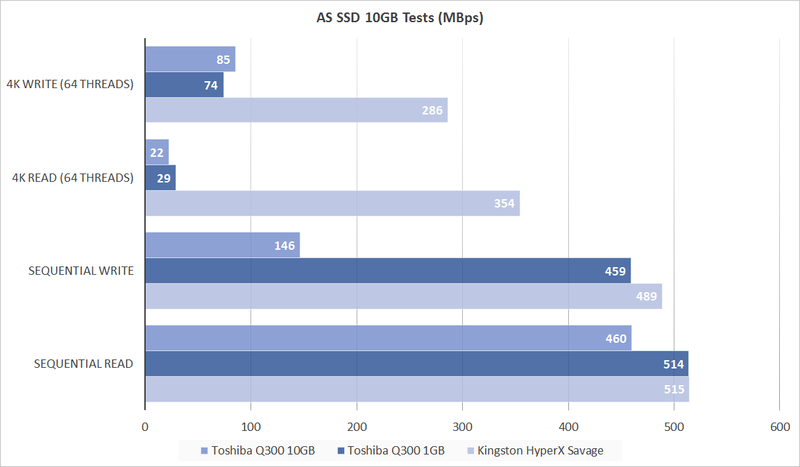 Toshiba’s TLC NAND-based Q300 2.5-inch SATA 6Mbps SSD, unfortunately, is one of those. If you think I’m exaggerating the performance drop-off, look at the graphic below. In the above 20GB write operation, MLC SATA 6Gbps SSDs will start at 400Mbps or more and stay there throughout the process. The Q300 does not. But the sustained write drop-off is not the real issue, because, as with most TLC (triple-level cell/3-bit) drives, the Q300’s day-to-day read performance and write performance with smaller file sets is fine. And, as annoying as it may be when it occurs, you’ll probably only experience this type of slowdown once in a while. The elephant in the room is the Q300’s price: $450 for the 960GB model, $310 for 480GB, $160 for 240GB, and $100 for 120GB. There are cheaper MLC (multi-level cell/2-bit) drives available that don’t suffer performance problems under any circumstance. The performance problem stems from the slow single-layer TLC NAND that’s used for the majority of the storage. Toshiba augments it with small amount of DRAM and faster SLC (single-level cell/1-bit) cache, but as with other drives employing TLC, the amount is rather small. Toshiba declined my request for information on cache sizes, but the OCZ Trion produced by Toshiba had 14GB of SLC in the 960GB; 7GB in the 480GB drive; and a mere 3GB in the 240GB and 120GB models. When the amount of data you’re writing to the drive exceeds the size of the faster cache, speed plummets to that of a hard drive. You can see the phenomenon in the screen capture at the head of the article. Samsung’s 850 EVO exhibits somewhat the same behavior, but drops only from about 500MBps to 300MBps because its V-NAND TLC is a heck of a lot faster. Toshiba might have expected better reviews. Everything looked just fine for the Q300 with CrystalDiskMark 5.02, reading at over 500MBps and writing nearly as fast. 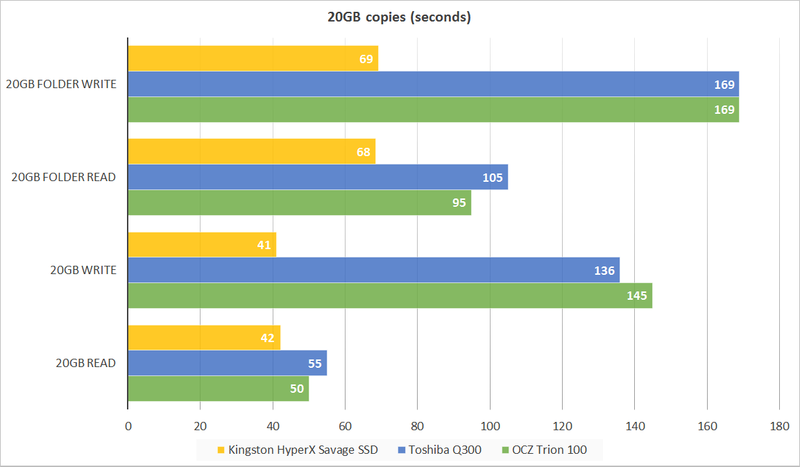 The non-threaded AS SSD numbers (below) looked fine as well with 1GB data sets (dark purple), but look at the 10GB numbers (medium purple)—the drop-off is astonishing. Please note that all testing was done with the 960GB model of the Q300. The numbers would be even worse with the lower capacities with their smaller caches (assuming the Q300 is like the Trion). I can hear some people saying “When am I ever going to copy that amount of data?” Maybe you never will. Maybe you will never back up to the Q300, copy a Blu-ray movie structure there, work with 1080p or 2160p video, or transfer your operating system to it. But I’m guessing you might, and you will not be happy about it as you ruminate over how you could’ve bought a cheaper drive that doesn’t suffer the same slow-down. If it were half the price, the Q300 might qualify as a bargain. It’s performance woes aren’t an everyday occurrence for most users. Avoid them entirely if you perform even moderately disk-intensive work. 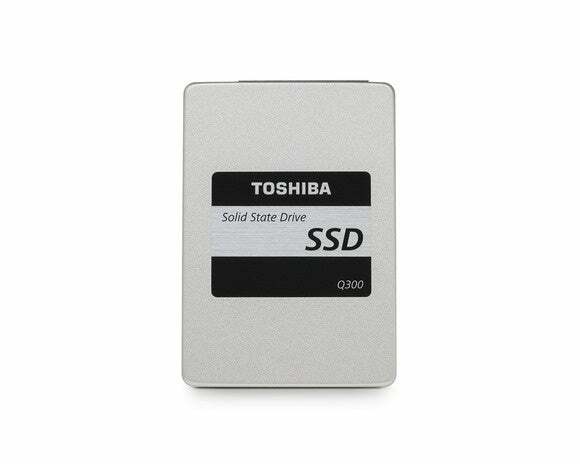 Note: Toshiba informed us that as of 11/9/2015 that the 960GB Q300 was available on the street for $409, the 480GB for $189, the 240GB for $99 and the 120GB for $59. That's much better pricing, but not low enough change our buying advice. 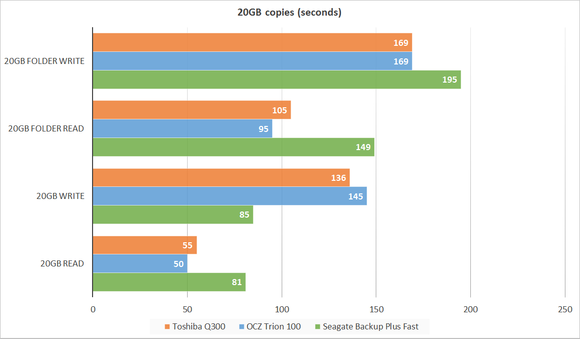 The Q300 and other single-layer TLC NAND drives dramatically under-perform when writing larger data sets. 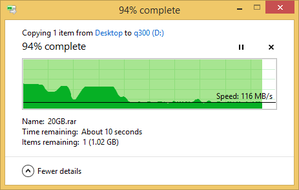 But the real issue with this drive is that it's being priced as if it didn't.